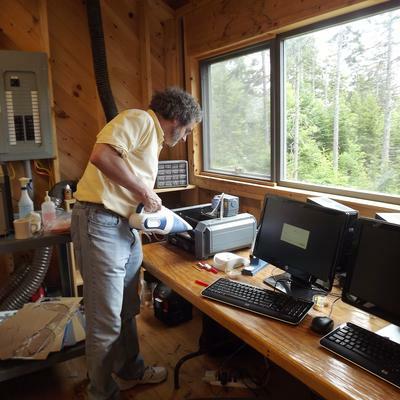 Neal Gershenfeld, director of the Center for Bits and Atoms at MIT, vacuums up after one of the digital fabrication machines at Haystack’s new fab lab. Photo by Jessica Brophy Order prints of selected PBP photos. Fab labs are digital fabrication studios, where small-scale, high-tech production equipment can take an idea from a sketch on the back of a napkin to a three-dimensional object in a matter of moments. Fab labs originated at the Center for Bits and Atoms at the Massachusetts Institute of Technology, and are now found in more than 100 locations across the globe. The lab’s machines can create three-dimensional objects from wood, metal, wax or plastic. Haystack Director Stu Kestenbaum said the idea came from Neal Gershenfeld, who is director of the Center for Bits and Atoms, and who served as visiting scientist last summer at Haystack. Kestenbaum sees the lab as an opportunity to stretch the creative work already being done at Haystack in new directions. The lab is housed in the former visiting artist’s studio, which has a newly constructed home just feet away. Kestenbaum said the lab would be a support space for ongoing workshops this summer. A different person from MIT will be at the lab all summer long to encourage collaboration between artists and machines. “I think this lab is complementary to what we already have,” said Kestenbaum. As with its workshops that are open to the community, Kestenbaum plans for collaboration with community members as well. The machines in the lab can make furniture, circuit boards, building blocks, printing blocks, molds, gears and other objects. “The fab lab has tools to turn data into things and things into data,” Gershenfeld said. The ultimate goal of the Center for Bits and Atoms is to create a Star Trek-like replicator, a machine that can make most anything. Until then, the fab lab at Haystack will help artists connect creatively with technology to amplify their vision.